When President Obama took office, he had a simple request for his staff: Send me ten letters a day. Ten letters that reflect what Americans from every corner of the country with every background — the stories, cares, and concerns of the very people who elected him to the presidency. 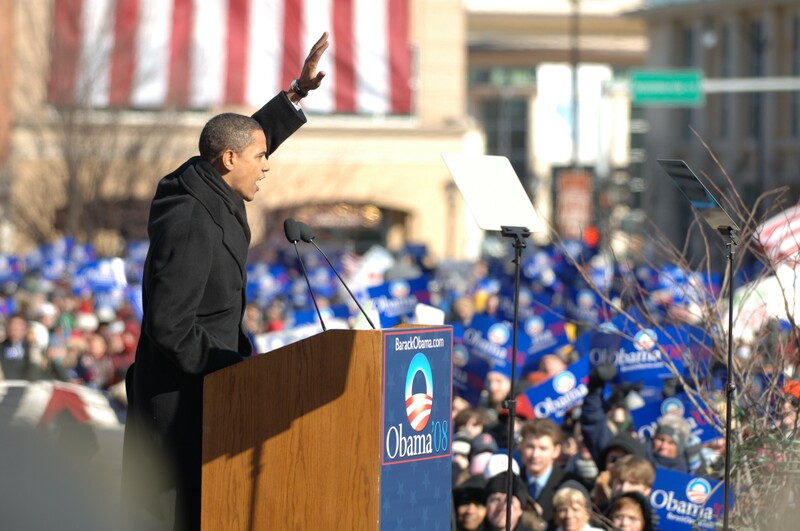 He’s continued that practice every day since, reading, responding, and visiting the homes and hometowns of letter writers who have inspired him and his policies. 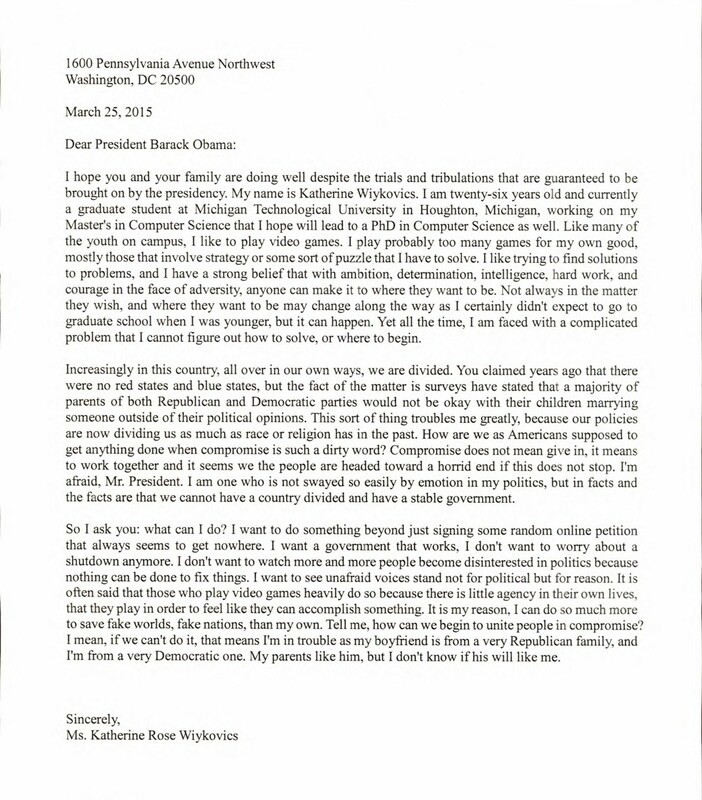 And today, as the President heads back to Springfield, Illinois where he began his “improbable quest” to the White House, we wanted to share one letter the President received from a young woman concerned about the state of our politics in America. In May of last year, Katherine Wiykovics told the President, “I’m afraid.” She feared that our politics had become so broken and so steeped in partisan rancor that the possibility of progress made together — by red states and blue states — was slipping from our grasp. 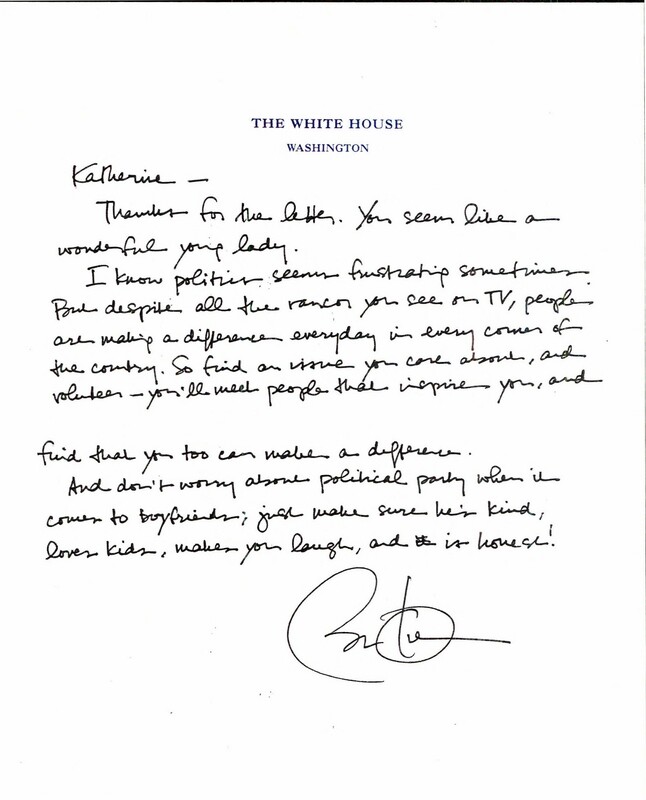 “So I ask you: What can I do?” The President would respond with a handwritten note. Read her letter, and the President’s response, below. I hope you and your family are doing well despite the trials and tribulations that are guaranteed to be brought on by the presidency. My name is Katherine Wiykovics. I am twenty-six years old and currently a graduate student at Michigan Technological University in Houghton, Michigan, working on my Master’s in Computer Science that I hope will lead to a PhD in Computer Science as well. Like many of the youth on campus, I like to play video games. I play probably too many games for my own good, mostly those that involve strategy or some sort of puzzle that I have to solve. I like trying to find solutions to problems, and I have a strong belief that with ambition, determination, intelligence, hard work, and courage in the face of adversity, anyone can make it to where they want to be. Not always in the matter they wish, and where they want to be may change along the way as I certainly didn’t expect to go to graduate school when I was younger, but I can happen. Yet all the time, I am faced with a complicated problem that I cannot figure out how to solve, or where to begin. Increasingly in this country, all over in our own ways, we are divided. You claimed years ago that there were no red states and blue states, but the fact of the matter is surveys have stated that a majority of parents of both Republican and Democratic parties would not be okay with their children marrying someone outside of their political opinions. This sort of thing troubles me greatly, because our policies are now dividing us as much as race or religion has in the past. How are we as Americans supposed to get anything done when compromise is such a dirty word? Compromise does not mean give in, it means to work together and it seems we the people are headed toward a horrid end if this does not stop. I’m afraid, Mr. President. I am one who is not swayed so easily by emotion in my politics, but in facts and the facts are that we cannot have a country divided and have a stable government. So I ask you: What can I do? I want to do something beyond just signing some random online petition that always seems to get nowhere. I want a government that works, I don’t want to worry about a shutdown anymore. I don’t want to watch more and more people become disinterested in politics because nothing can be done to fix things. I want to see unafraid voices stand not for political but for reason. It is often said that those who play video games heavily do so because there is little agency in their own lives, that they play in order to feel like they can accomplish something. It is my reason, I can do so much more to save fake worlds, fake nations, than my own. Tell me, how can we begin to unite people in compromise? I mean, if we can’t do it, that means I’m in trouble as my boyfriend is from a very Republican family, and I’m from a very Democratic one. My parents like him, but I don’t know if his will like me. Thanks for the letter. You seem like a wonderful young lady. I know politics seem frustrating sometimes. But despite all the rancor you see on TV, people are making a difference everyday in every corner of the country. So find an issue care about, and volunteer — you’ll meet people that inspire you, and find that you too can make a difference. And don’t worry about political party when it comes to boyfriends; just make sure he’s kind, loves kids, makes you laugh, and is honest!